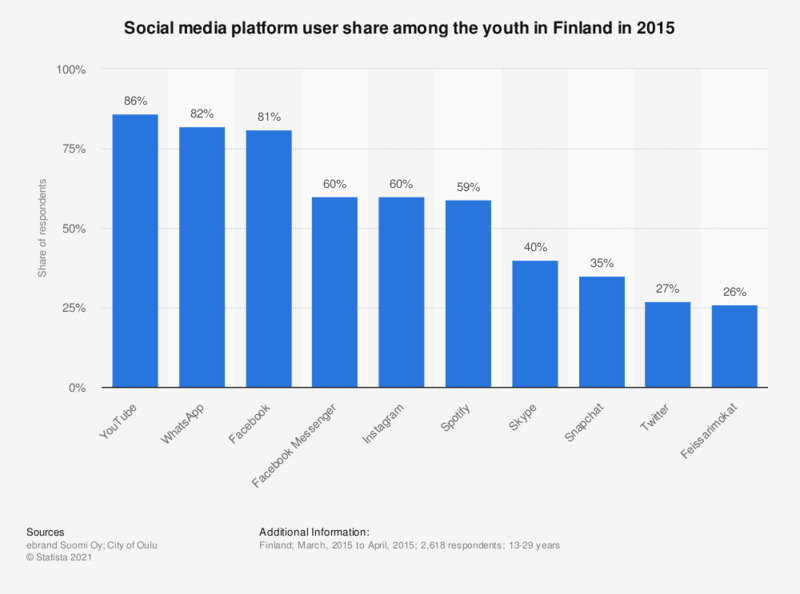 This statistic shows the share of users of the most popular social media platforms among the youth in Finland in 2015. During the period under survey, roughly 81 percent of the respondents stated they used the social media platform Facebook. 13 to 17-year-olds (n=998), 18 to 22-year-olds (n=924) and 23 to 29-year-olds (n=696). Statistics on "Organic food consumption in Finland"
Do you consume organic food? To what extent do you agree with the following statements about organic food and organic food production? In your opinion, how do organic food products differ from other food products? On a scale of 1 to 7, how well do the following characteristics fit to your image of organic food? On a scale of 1 to 7, how interested are you in organic food? How attractive do you consider organic food when buying groceries? Which organic food products have you bought recently? Where have you bought organic food products? What are your reasons for buying organic food? Which organic food products do you intend to buy more often in the future? How frequently do you consume the following organic food products? How frequently do you consume organic meat and meat products? How frequently do you consume organic chicken and turkey? How frequently do you consume organic eggs? How frequently do you consume organic milk? How frequently do you consume organic vegetables? How frequently do you consume organic fruit and berries? How frequently do you consume organic herbs? How frequently do you consume organic cereal products? How frequently do you consume organic nuts and seeds? Why do you think people usually get involved in trolling / online bullying?